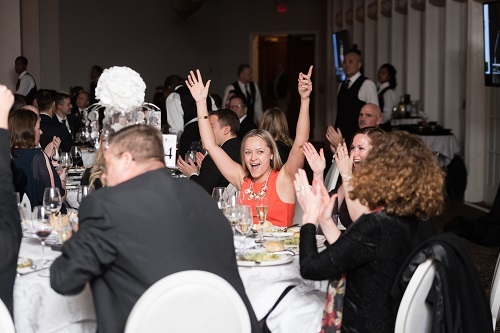 The mortgage industry’s best and brightest were recognized and celebrated at the 12th annual Canadian Mortgage Awards at Toronto’s Liberty Grand—and what a Friday night bash it was. Dominion Lending Centres emerged as Canada’s top network, winning the National Broker Network of the Year Award. CanWise Financial was up for four awards and took home the Award for the Mortgage Brokerage of the Year (25 Employees or More), and according to the company’s president and broker of record, it was a night to remember. Anne Brill of Centum Metrocapp Wealth Solutions won the Award for Mortgage Broker of the Year (25 Employees or More), and says she couldn’t have done it without the support of her outstanding team. Festivities got off to start with attendees from coast-to-coast catching up with each over cocktails before they made their way to the reception room where Collin Bruce accepted the first award of the night for Best Use of Mobile Technology. In his very first year as a mortgage broker, Akash Sharma of Able & Remarkable Mortgages won the award for Alternative Broker Specialist of the Year (Business for Self), and it can only signify things to come. These awards are oscar awards of mortgage industry. I feel honored and i thank entire jury members for recognizing our efforts in doing quality business.